During the 1970s, The Stranglers toured Japan twice, joining the alternative music scene of Tokyo, which was evolving from the punk sound of Kyoto based band 村八分 (Ostracism), whose music influence spread to Tokyo in 1971. The Stranglers were the only foreign band to take part in a landmark scene focussed around S-KEN Studio in Roppongi, and The Loft venues in Shinjuku and Shimokitazawa from 1977 to 1979 with the bands “Friction” “ARB” and “Red lizard”. Burnel also toured with ARB at the Japan Rock Festival at Hibaya Park appearing on the songs , “Yellow Blood” and “Fight it Out”. In1979 Burnel released an experimental solo album Euroman Cometh, Cornwell recorded the album Nosferatu in collaboration with Robert Williams and the Stranglers released The Raven, which heralded a transition towards a more melodic and complex sound and included the songs “Duchess”,”Nulcear Device”,”Don’t bring Harry”,”BearCage” and “ShahShah a Go Go”. The Stranglers’ next album The Gospel According to the Meninblack, a concept album exploring the connection between religious phenomena and extraterrestrial visitors and contained the song “Who Wants the World”. This was followed by La Folie (1981) another concept album, featuring the songs , “Let Me Introduce You to the Family”, and “Golden Brown” an evocative waltz-time ballad, with an extra beat in the fourth bar. The Stranglers then released a greatest hits collection, The Collection 1977–1982 which ncluded the new single “Strange Little Girl”,and in1983 they released Feline, which included the UK No. 9 hit “European Female”. In 1984 they released Aural Sculpture which feature the three-piece horn-section. In 1986 they released the album, Dreamtime, dealt with environmental concerns and featured the song”Always the Sun. The Stranglers’ next album, 10, featured a cover of The Kinks’ “All Day and All of the Night” and another ’60s cover, “96 Tears” and, the follow-up singles”Sweet Smell of Success” and”Man of the Earth”. In August 1990, founding member Hugh Cornwell left the band to pursue a solo career. So the Stranglers recruited John Ellis, who had had a long-standing association with the band And had worked with Burnel and Greenfield in their side-project Purple Helmets, and they recorded four albums: Stranglers in the Night (1992), About Time (1995), Written in Red (1997) and Coup de Grace (1998). In 2004 The Stranglers made a comeback with the acclaimed Norfolk Coast album and a subsequent sell-out tour, together with their first Top-40 hit “Big Thing Coming”. In 2005, Coast to Coast: Live on Tour was released, supported by “Goldblade”. In May 2006, Roberts left the band, leaving Burnel, Black, Greenfield and Warne. Suite XVI, the follow-up album to Norfolk Coast, was released in September 2006 (the title is a pun on “Sweet 16″ and also a reference to the fact that it was the band’s sixteenth studio album) and featured punk and the country and western Johnny Cash pastiche/homage “I Hate You”. On 4 November 2007, the band (with Black) played a sell-out gig at the Roundhouse in Camden, North London, marking the thirtieth anniversary of their headline run at the same venue in 1977. During 2008, The Stranglers played various major festivals around Europe and Jet Black sadly suffered some health problems however he was back with the band for their UK tour later in the year. In 2009 the band played at the biggest open-air festival in Europe (400,000 – 500,000 rock fans every year) – Przystanek Woodstock inPoland And in 2010 they played a sold out 16 date UK tour, Including a return to the Hammersmith Apollo in March. A new double CD compilation album, Decades Apart, containing at least one track from their sixteen studio albums plus two new tracks, “Retro Rockets” and “I Don’t See the World Like You Do” was released in February 2010. They also played a number of festivals, including Weyfest, Glastonbury and T in the Park in the UK and Oxegen 2010 in Ireland, and concerts in Japan, Greece, Poland, Slovakia and Bulgaria.In May 2010 The band released a new live album and DVD, recorded at the Hammersmith Apollo and in March 2011, the band completed another UK tour. Supported by Burnel’s long term friend, Wilko Johnson, & The Wilko Johnson band. In April, 2011 the Stranglers toured Europe, and started work on a new album Giants, which was released in 2012, containing their first instrumental since “Waltzinblack” on The Gospel According to The Meninblack. The “deluxe” version consisted of a second disc also contained tracks from the ‘Weekend in Black’ acoustic session in November 2011. In 2013 the band played a full UK tour. Several festivals and a session at the BBC Proms on 12 August. On September 2014 the band celebrated their fortieth anniversary and embarked on a Ruby tour throughout the UK (22 dates) and Europe (16 dates) started on February 27th 2014. Best known for his parts in the Monty Python Television Series and Films, the actor, writer and composer Eric Idle was born 29th March 1943. Eric Idle joined British sketch comedy series Monty Python alongside Graham Chapman , John Cleese, Terry Jones and Michael Palin. The first episode of British sketch comedy series Monty Python’s Flying Circus aired on BBC One on the 5th October 1969 and there were 45 Episodes spread over four seasons until December 1974 on BBC Television. The comedy was often pointedly intellectual, with numerous erudite references to philosophers and literary figures. The series followed and elaborated upon the style used by Spike Milligan in his groundbreaking series Q5. The team intended their humour to be impossible to categorise, and succeeded so completely that the adjective “Pythonesque” was invented to define it. The shows were composed of surreality, risqué or innuendo-laden humour, sight gags and observational sketches without punchlines. They also featured Terry Gilliam’s wonderful and imaginatively bizarre animations, often sequenced or merged with live action. Broadcast by the BBC. with 45 episodes airing over four series from 1969 to 1974, The show often targets the idiosyncrasies of British life, especially that of professionals, and is at times politically charged, and over the years many of the sketches have attained classic status including The Lumberjack Song, Ministry of Silly Walks, Upper class twit of the Year,Spam song, The Dead Parrot Sketch (Bleedin’ demised, Joined the choir invisible 😀 and Bicycle Repair Man. The members of Monty Python are all highly educated. Terry Jones and Michael Palin are Oxford University graduates; Eric Idle, John Cleese, and Graham Chapman attended Cambridge University; and American-born member Terry Gilliam is an Occidental College graduate. Chapman also played the lead roles in two of the Python’s Films – Monty Python and The Holy Grail, Life of Brian. 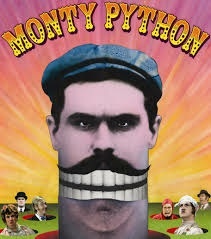 In addition to mo Python Eric Idle also appeared in the the children’s series Do Not Adjust Your Set, alongside Terry Jones, Michael Palin and Terry Gilliam’s surreal animations which linked the show’s sketches together, and defined Monty Python’s visual language in other media (such as LP and book covers, and the title sequences of their films). Since Monty Python split Idle has also appeared in Many films including Nuns on the Run and National Lampoons European Vacation. Glass key award winning Norwegian author and musician Jo Nesbø was born born 29 March 1960, he worked as a freelance journalist and a stockbroker before he began his writing career. As of March 2014 more than 3 million copies of his novels have been sold in Norway, and his work has been translated into over 40 languages, selling 23 million copies (2014). Nesbø is primarily known for his crime novels about Inspector Harry Hole, Which follow Harry Hole, a tough detective working for Crime Squad and later with the National Criminal Investigation Service (Kripos) who struggles with alcoholism and works on solving crimes in authentic locations in Oslo and elsewhere, from Australia to the Congo Republic.Hole takes on seemingly-unconnected cases, sometimes found to involve serial killers, bank robbers, gangsters or the establishment, but also spends a significant amount of time battling nightmares and his own demons. The Harry Hole novels are multi-layered, violent and often feature women in peril, as typified by The Snowman. It has also been announced that, Nesbø has written at least three novels under the pen name Tom Johansen, provisionally entitled Blood on Snow, More Blood on the Water and The Kidnapping, scheduled to be published in autumn 2014 and spring 2015. Film studio Warner Brothers has also bought the rights to Blood on Snow and plan to make a screen adaptation, to be produced by and possibly starring Leonardo DiCaprio. Other Nesbo novels adapted Into films include the 2011 film Headhunters which is based on the novel Hodejegerne (the Headhunters). Future projects include A new TV crime drama series entitled Occupied, based on a concept by Jo Nesbø, is to be co-produced by Norway’s NRK and French-German network Arte. Yellow Bird, the Swedish production house responsible for the Wallander TV series, and the films Headhunters and The Girl with the Dragon Tattoo, has begun work on the first series of ten episodes. The series is described as a multi-layered political thriller which envisages what would happen if Norway were to be invaded by Russia in order to seize the nation’s oil resources. Aside from writing he is also the main vocalist and songwriter for the Norwegian rock band Di Derre.